Feugen was added in the Curse of Naxxramas Adventure. He is available from Wing 4 - The Construct Quarter which opened on August 12th, 2014, and is obtained after defeating the adventure boss Thaddius. Feugen combos with Stalagg to summon Thaddius. Need help conquering the Curse of Naxxramas Adventure to obtain Feugen? Head on over to our Curse of Naxxramas Adventure Guide! What happens if on of those is silenced? Will it stop the summon? 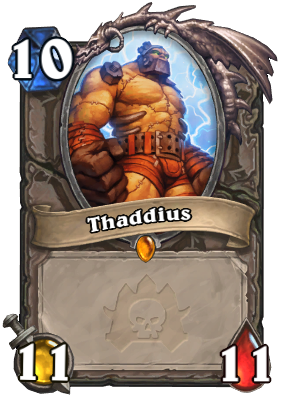 If the first one to die is silenced, the second one can still summon Thaddius. If the second one to die is silenced, then it will prevent Thaddius from being summoned. I would expect the "Used in % of all decks" stat to be the same for Feugen as it is for Stalagg, yet there is a difference of .02% (.73 - .71 = .02). I know it's minuscule, but isn't it odd that there is someone who would include Feugen in the deck but not Stalagg? Feugen is a very strong minion by itself in the 5-mana slot. Along with a meaty 7 health, it has 4 Attack which puts it in the dead zone of Priests too. Many decks may potentially run Feugen without running Stalagg. Interesting point. Where did you quote that from? Don't you like the golden animation? do u like golten animatoon? Probably the most incorrect flavor text in the game. Everyone likes Feugen better; whoever wrote this flavor text shoud be sacked. Considering that Stalagg's quote is "Stalagg want to write own flavor text. "STALAGG AWESOME! "", I assume that Stallagg wrote Feugen's flavor text too.. 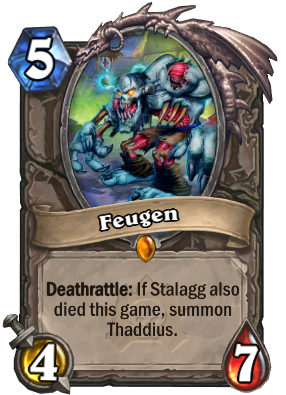 It is interesting because if an enermy Feugen attacks your Stalagg, both players summon a Thaddius. With these two cards growing in popularity, it is a scenario to consider when playing. In addition, if both your own Stalagg and Feugen die on the same turn to something like Poison Seeds, you summon two Thaddius's (Never meant to be a plural word). Flavor text is wrong, why would anyone "like Stalagg better" since Feugen generally would trade better? Lets give Feugen-bro more looove. Are you sure about the silence on the first of the two minions?Because the Deathrattle that takes place is of the second one to die and the first one doesnt need its Deathrattle. Indeed. Even if one of them no longer has its card text, it can still die. As long as the second one to die isn't the one being silenced, Thaddius should still appear. In the case of them dying at the same time, I'd imagine the silenced deathrattle wouldn't trigger, but the other would. Fix the name please, it hurts my friend's OCD.